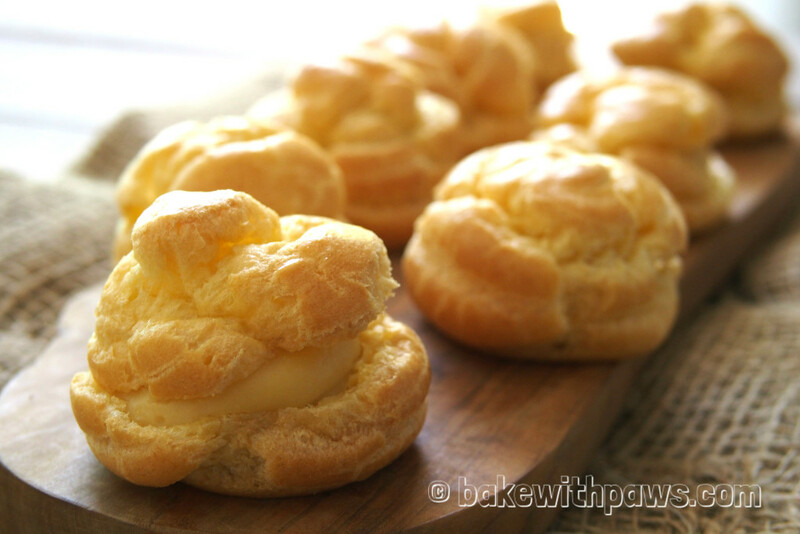 Cream Puffs with Sweet Corn Custard Filling! 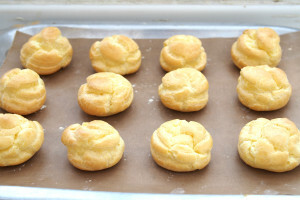 During a Chinese New Year family dinner this year when I was back in Penang, my sister made us cream puffs for dessert. I loved it so much I asked her for the recipe which she was generous to share. I tried it immediately when I returned to KL. The first time however, I over baked the pastry and they turned out a little hard. I tried it again last week and this time I got it just right. Pre-heat oven to 450F or 230 C.
Pour in butter, water and salt into a saucepan and bring to boil. Then add flour at once into the boiling liquid. Stir thoroughly until mixture form into a ball of dough and does not stick to the side of the pan. 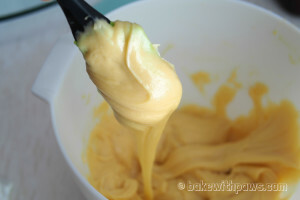 Remove from the heat, transfer dough into a bowl of a stand mixer with paddle attachment. Let it cool slightly. At medium speed, add eggs, one at a time, mix until well combined. The pastry dough should be shiny, thick, smooth and sticky. Place dough in piping bag with round plain tip and pipe onto baking pan lined with baking sheet, 1 inch apart. The size is around 1 ½ inch diameter or at your desired size. Smooth the pointy tops with a wet finger. 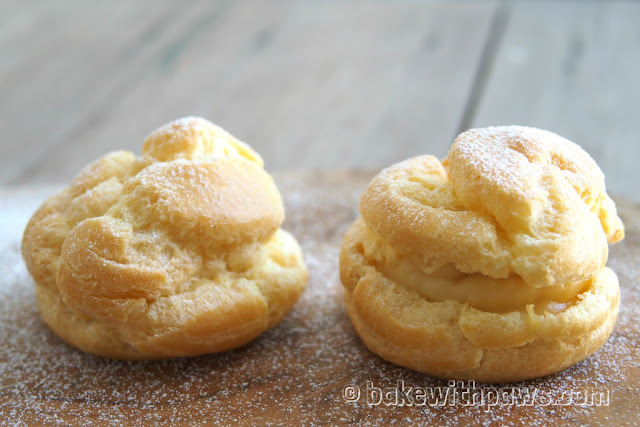 Blend custard powder, corn starch, eggs and some of the milk. Set aside. Pour water, remaining milk, cream corn and sugar into a saucepan, bring almost to boil over medium heat. Lower heat and add eggs custard mixture. Stir all the time until the mixture become thicken. Remove from heat, add in butter and vanilla extract, and mix well. Cut each cream puff horizontally into two halves. 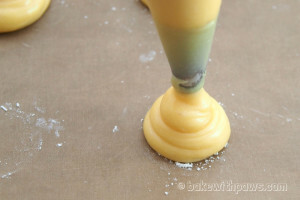 Transfer sweet corn custard filling in piping bag with round plain tip and pipe it into the bottom half of each cream puff and close with the upper half.